Shiv Sena indirectly criticised the BJP's 'Sampark for Samarthan' (Contact for Support) campaign, which is being promoted by party president Amit Shah. 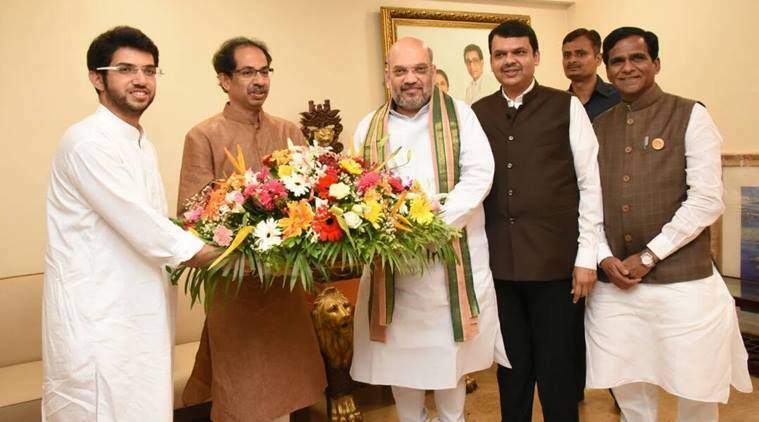 MUMBAI: Hours prior to Bhartiya Janata Party (BJP) Chief Amit Shah's meeting with the Shiv Sena Supremo Uddhav Thackeray in Mumbai, the Sena today said it will contest the 2019 general elections on its own, thus effectively ruling out a long-term tie-up with BJP. Pointing to its performance in the recently held Palghar by-poll, which showed a rise in the number of votes shares the Shiv Sena through its mouthpiece 'Saamana', said the result in the polls has given them a message that they don't require any 'poster boy' to contest elections. It also indirectly criticised the BJP's 'Sampark for Samarthan' (Contact for Support) campaign, which is being promoted by party president Amit Shah. "Why is the BJP doing 'Sampark for Samarthan' campaign after their defeat in the recently-held by-polls. Shiv Sena will fight the 2019 general elections on its own strength. The Palghar by-poll has shown the power of the party. Despite being in power, the BJP has lost its connection with the people. A party like Shiv Sena has always moved ahead keeping in mind 'jansampark' (interaction with people) and 'janadhar' ( for the benefit of people), and, it doesn't require any poster boy to fight or win an election," read the editorial. It further questioned the strategy of the BJP during the Palghar by-poll, which was won by Rajendra Gavit. "We have never been in the business of seeking votes by changing photographs in the poster. During the Palghar by-poll, the photographs of Prime Minister Narendra Modi and BJP President Amit Shah were replaced by late Chintaman Vanaga. Despite Vanaga's family opposing the move, BJP still campaigned in his name rather than that of the Prime Minister," the editorial said. Besides that, the Shiv Sena said that forming a partnership with the BJP means "means killing your own freedom of 'janadhar'." "Andhra Pradesh Chief Minister N Chandrababu Naidu has already cut ties with BJP. The truth is that the biggest 'Sampark' scam is currently on in Bihar. The second, third honeymoon of Nitish Kumar and BJP's alliance is on the verge of a decline in Bihar. K.C. Tyagi has started this controversy. BJP does not care about their friends, they themselves have said this," Shiv Sena stated. "Nitish's 'janadhar' is ending in Bihar now. His misconceptions about not having any competition in Bihar after sending Lalu Prasad Yadav to jail have ended. BJP wants the Prime Minister to be the poster boy in 2019 general elections, however, JD(U) is not happy with that. Therefore, allying with BJP means killing your own freedom of 'janadhar', a lot of people think this," the editorial concluded.